Cancer Diagnosis? See Your Dentist in Long Grove. Cancer is a scary word and a diagnosis none of us want to hear. 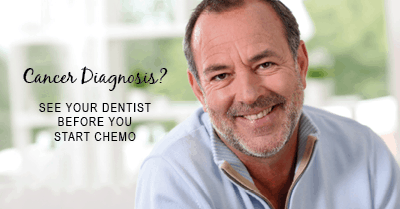 But if you or a loved one has been diagnosed with cancer, seeing your dentist in Long Grove before starting chemotherapy is a crucial step toward a successful treatment. While chemotherapy helps treat cancer, it also causes several side effects to the rest of your body, including your mouth. In fact, some of the oral health problems associated with chemotherapy can actually cause a delay or stop in treatment. Clearly, when you’re dealing with something as serious as cancer, it’s never ideal to stop treatment. This is why I recommend visiting my dental office in Long Grove at least one month prior to beginning chemotherapy. Your dentist in Long Grove is an important part of your cancer treatment and can help keep dangerous side effects away. Often times, the oral side effects from cancer treatment occur in unhealthy mouths, and while not all side effects can be avoided, the healthier your mouth is the more likely the side effects can be avoided and treatment can continue as planned. Ideally, it’s best to schedule an appointment at my Long Grove dental office one month before cancer treatment begins. When you visit, my team and I will perform an in-depth exam, clean your teeth, and take care of any mouth problems we may find. We’ll also discuss the best way for you to care for your mouth at home to prevent side effects. If you or a loved one have been diagnosed with cancer please give my dental office in Long Grove a call as soon as you can. Our mission is to provide compassionate, quality care to allow for the most successful treatment possible.